The strong benefit of a database is the synopsis of otherwise widely spread informations. Apple’s App Store offers a lot of apps suitable for productive operations but all the informations saved by these apps are cut into pieces saved in app-specific folders. You can use Safari for saving links, Pages for saving text documents, etc. but you cannot connect the information as a whole. A well designed database is an appropriate approach to the problem. There are a lot of ways to design a database and there is no rigorous right or wrong with creating them relying on the arbitrariness of human thoughts. It’s largely a matter of personal preference. As you think of new aspects of your subject, you can type them in anywhere and then move them around to fit. You can think of a mind map as a sort of two-dimensional outline; rather than organizing ideas into a linear list, you spread them around the page and connect them. You’re not limited to plain text on a mind map. In fact, you almost certainly want to use fonts, icons, bitmaps, colors, and so on to dress up a mind map. It’s been my experience that the more playful you make these things, the more likely you are to come up with interesting ideas. A good mind map will both record your ideas and provoke them. So the decision is to use a mind map for the creation process. You might ask why the different researches are not saved in different mind maps instead of a database. There is a simple answer. 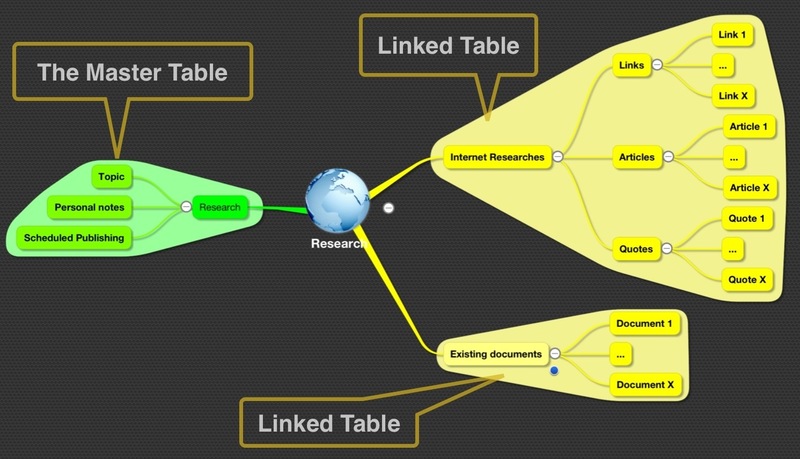 If you have a few researches take the mind mapping tool. Take a database for a large number of researches. The benefits of a database compared to a great number of mind maps are the compact format, the ability to search, to print special data in a non-graphical format and group them by tags, categories etc.. Visualization is a perfect way to show a limited number of informations while it is confusing to look at large data volumes presented graphically. I want to manage all results of my researches about a topic. Now it’s brainstorming time and so it’s mind mapping time. A mind map reflects all the ideas you had about your topic. It can be used as the framework of our database. Level 1 subtopics of the mind map correspond to the tables of your database and further levels to fields or further tables. 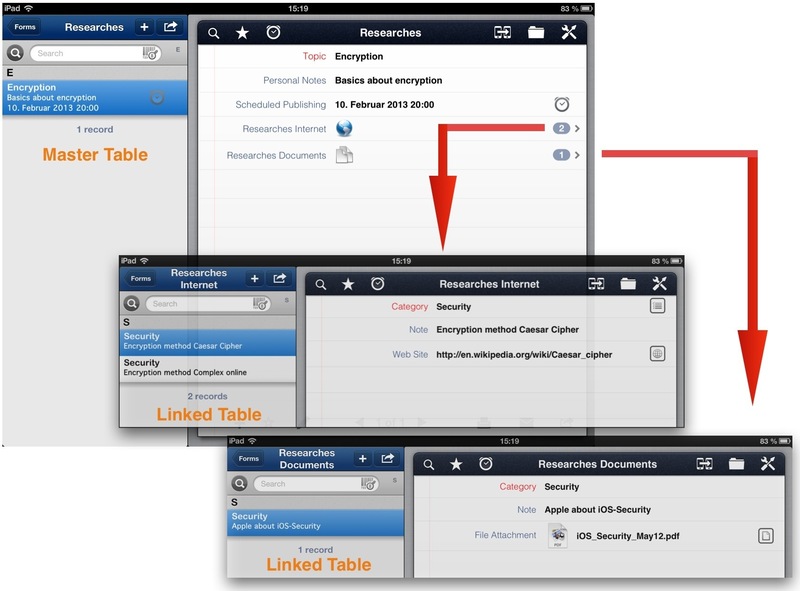 All subtopics contain data of one specific research so you have to create a so-called Master-Table with which all the other tables are connected to. If you plan to use a database on your iPad it’s highly recommended to do mind mapping before creating the database, entering all the data, and then flush it to the toilet and start new. The idea was to manage all results of researches about specific topics. So here is a simple mind map created with iThoughts (by Craig Scott, UK). To keep it simple this mind map in a first step does not contain functionalities of the database application. In a professional environment the design process has to consider the database structure as well as the requirements of its users. Now we have to transform the mind map into a database structure. We use Tap Forms HD (by Tap Zapp Software Inc., Canada). Users don’t want to think about the appropriate file management for the data they have to work with. Developers usually don’t like to deeply engage in the specific fields of activity of the users. So how can developers be paired up with the users. Mind maps may help as they reflect the requirements of users as well as the more structured thoughts of developers. The result may be a more efficient software application and the mind maps may serve as a common knowledge base for both sides, developers and users, for future updates and improvements. Comments and shares are highly appreciated.